Ted: Please describe your store for our readers? Alyssia Hylton As an NSU Alumni we wanted to be close to Northeastern State University on the booming North End of Tahlequah as well as within walking distance to great places to eat so when this location became available we couldn’t resist! The exterior of the store has beautiful original wooden details and after a complete renovation of the interior we ended up with a final product that is warm and inviting. We carry extremely comfortable Mavi jeans, Wood underwear, shirts of all styles, Bedstu shoes, Martin Dingman belts...anything to make a man in Tahlequah the best dressed in any room. Alyssia: We are the ONLY men’s clothing store in Tahlequah, OK and we concentrate on comfort just as much as style so every single brand feels awesome. Guys can get just about everything they need in one place. Boulevard is also owned by a female which puts a unique perspective on how we dress men. Ted: What do you look for in a men’s brand? Alyssia: One of the brands that really stands out for us is Wood Underwear because of the comfort, moisture wicking properties and amazing customer service. They also offer a variety of colors and sizes so everyone is happy. 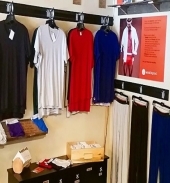 We recently expanded to their shirt and lounge wear lines which have done outstanding as well! Swimwear is a new item for us and Southern Marsh has been keeping us stocked with the most handsome colors and patterns. I really like swimwear that can double as shorts for the versatility and convenience. Washed red and seersucker have been our top sellers so far and we have only just begun! We can’t seem to keep our Mavi Jeans imported from Turkey in stock either. Guys aren’t used to having a jean that you can wash any way you please while also feeling comparable to sweatpants. They stretch and we absolutely love them. Great shoes are always important and BedStu has created the most comfortable, handmade shoes with naturally tanned leather that is not covered in synthetic coatings. Guys have become very expressive with their sock fashion and Sock it to me Inc. carries such a huge line of crazy, funky, cool socks that it will take forever to stock them all but that is our goal! One of our new brands that we just brought into the store is Two Guys Bowties out of Tulsa, Oklahoma. Their wooden bowties are handmade and crafted from their home and shipped individually to us. They also make outstanding beard oil and tiny beard combs that keeps our customers coming back for more. All of our brands keep us very happy. They seem to keep us at the top of their priority list which makes us feel even better and we always look forward to meeting with them regarding reorders. Alyssia: Guys are really making an attempt to dress up while remaining comfortable and we are so excited to be the place they turn to. We try to carry a variety so that not everyone looks the same in a small town. We also try to be original, so we teamed up with Nova Screen Printing to produce several original designs that are all printed on the softest triblend shirts. We are selling them faster than we can come up with new ideas! Natural skincare products and beard care is becoming more of a priority for men as well. We have over 20 different products to choose from with companies like Grave Before Shave, Bulldog Skincare and EveryMan Jack. Alyssia: We purposefully have a wide range of price points and sizes so that we can cater to just about anyone. Not being able to shop somewhere because of financial limitations or size restrictions is not something we like for our clients to encounter. Alyssia: We always run out of mediums first as well as 32-34 waist size in pants but as we have been stocking more 2xl shirts and waist sizes up to a 42 our order process is tilting towards more athletic builds. The great thing is that if we don’t have your size we will special order it for you at no extra cost. Alyssia: Since we have such a wide variety of prices the average customer spends anywhere between $15-$150. We have prices to fit any budget whether you are buying a small gift to let someone know you were thinking of them or an entire new wardrobe. Alyssia: We have such a diverse customer base that we thought would be mostly men but it has surprised us how many women shop here for their significant others and for themselves! With Northeastern State University just up the street we get the privilege of dressing our college guys and professors who have really liked the southern and casual styles such as Southern Marsh and Rowdy Gentlemen. Alyssia: The support of our local community has been overwhelming and is the best thing any business owner could ever ask for. Trying something new like a certain product or a different form of advertising is always a little scary but if you just go with your gut and do it regardless of what others are doing, it really pays off. Social media has also had a very big impact and is the best way for us to reach our clients. It seems the better we become at it the more results we see and we can keep in touch with our clients to see what’s trending.